In this article the guidance is of a general nature as each telescope has differences in design depending on the supplier and the components used. Illustrations are from the Skywatcher 120mm f1000 refractor assembled in the previous article. 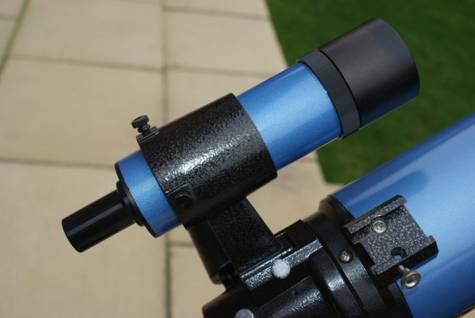 The Skywatcher 120mm is fitted to an EQ5 Equatorial Mounting on a Field Tripod. It is first necessary to correctly align and level the telescope mounting or it will not track objects correctly as they appear to move across the sky due to the rotation of Earth. First a few words about alignment. In the northern hemisphere the best direction to align the telescope is so it has its best view to the south. The reason for this is to do with the tilt of Earth’s axis of rotation. Earth is tilted approximately 23.5° to the plane of the solar system and we in the UK are located towards the north of the planet. If an imaginary line is projected from the north pole of Earth it will point approximately to the star Polaris in the constellation of Ursa Minor (the Little Bear). Because we are located 51° north, Polaris is positioned about 38.6° north of our zenith (the point directly overhead). Polaris is almost on the axis of Earth therefore it appears to remain stationary with the whole sky rotating around it every 24 hours. If we mount our telescope facing south we will be able to see 128.6° (90° + 38.6°) of declination (elevation) of sky rotate through our line of sight (from the south horizon up to Polaris). 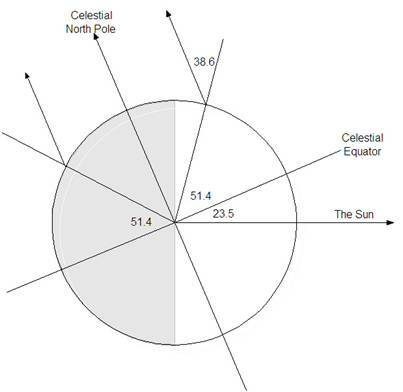 If the telescope was aligned to face north only 51.4° (90° - 38.6°) would pass the line of sight. The first thing to do when setting up the telescope is to establish where south is. A simple compass is good enough if visual observing is the aim. However if long exposure photography is planned then more accurate alignment will be required. 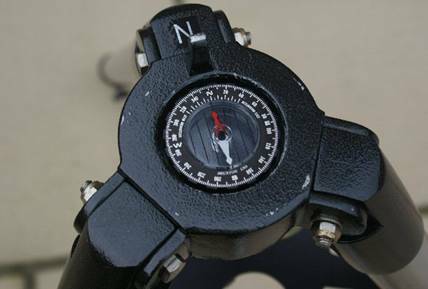 If the mounting has not been fitted to the tripod stand then the compass can be positioned on the mounting head and the ‘north’ mark on the stand aligned with the compass needle. The compass may otherwise be positioned close to the mounting which can then be aligned to the needle. Do not at this stage align the mounting too accurately because the height and level may need to be adjusted. Extend and lock the tripod legs to the required height. Use a bubble gauge to level the tripod. 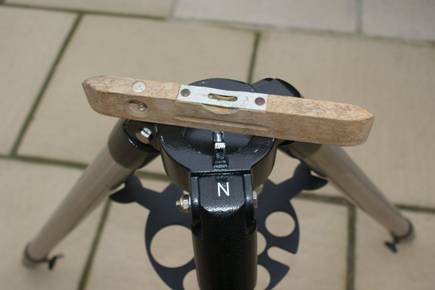 If the telescope is already fitted to the tripod the bubble gauge can be placed or held on a horizontal part of the mounting. Some mountings have an integral bubble gauge that makes levelling much easier. When levelled re-check the alignment to north with the compass and adjust the position of the stand if necessary. If the telescope and mounting are not fitted then complete the assembly as described in the article for assembling the telescope. When assembly is complete we can move to the next stage of setting up. The next operation is to raise the RA axis of the mounting so that it is aligned on Polaris (the North Star). Polaris is very close to the Celestial North Pole. This is the point in the sky where the axis of Earth appears to point in the northern sky. See the diagram below. Our planet is tilted at approximately 23.5° to the plane of the solar system. To use our Equatorial Mounting to good effect we must tilt the Right Ascension axis of the mounting so that it points in the same direction as the axis of Earth (towards Polaris). The mounting has a tilting mechanism built in to make it easy for us. The mounting has a RA position dial and screws to enable the RA to be set to the correct angle. The picture above shows the RA elevation dial and the two adjusting screws. The dial is graduated so that the latitude of the observer’s location can be set in to give the correct RA setting angle. The latitude of the observing position can be found on a UK Ordinance Survey map or using Google Map on a computer. The latitude of Newbury in the UK is approximately 51.4 degrees north. To set the mounting to this angle loosen the locking device (this may be a clamp or a ‘lock-nut’ on the adjusting screws). Screw the adjusting screws in or out to raise or lower the RA until 51.4° is aligned with the pointer then lock RA adjuster. This setting will be good enough for initial set up but more accurate adjustment can be carried out when we are ready to start observing. Return the telescope to face south. The next step is to align the finder with the main telescope. 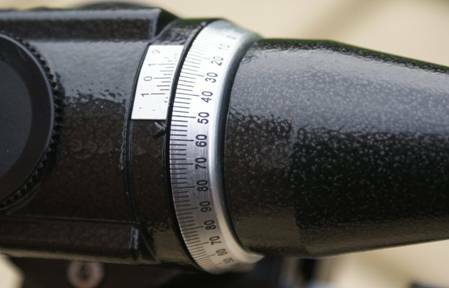 Most entry level telescopes are supplied with a Red Dot finder or perhaps a 30 x 8 telescopic finder. The more expensive models have a 50 x 8 telescope. The finder is fitted into a location ‘DoveTail’ which is normally part of the focuser unit. Fit the finder as shown below. Fit a low power eyepiece (25mm) into the focuser unit. Locate a bright star or planet and aim the telescope at this object. Look along the telescope tube, release the clutches and roughly align the telescope on the object. Gently move the telescope around while looking through the eyepiece until the object appears. Lock the telescope clutches. Use the slow motion drives to centralise the object in the eyepiece. Look through the finder and use the adjusting screws to centralise the object. Re-centralise the object in the main telescope and centralise in the finder again. When alignment is complete the finder is ready to use. 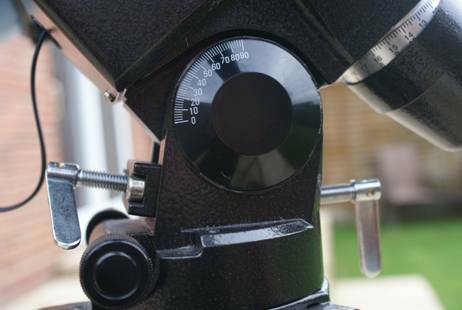 Move the telescope away from the object then use the finder to find the object and make sure it is also in the eyepiece. Now to continue the theme of polar alignment we will think about more accurate alignment. To do this we must have a clear view towards Polaris (the Pole Star) because we will be aligning on Polaris. If the telescope needs to be moved to a different position it must be re-levelled and aligned on north. The heavier EQ mountings (EQ3, EQ5 and EQ6) have a hollow shaft on the RA axis. This means it can be used to align on Polaris by simply looking up through the shaft. The EQ1 and EQ2 may not have a hollow shaft so very accurate alignment is more difficult. First rotate the RA and Dec until the telescope main tube is pointing north and lock the RA. Lower the tube until it is level with the ground. Position a bubble level gauge on top of the tube (it can be secured using elastic bands, Velcro or adhesive tape). Adjust the telescope tube until it is horizontal as shown by the bubble being central in the gauge and lock the Dec. The Dec axis has a graduated barrel to indicate its elevation. This barrel can normally be rotated so rotate it until ‘0’ is aligned on the arrow mark. Release the Dec clutch and raise the tube until 51.5° is aligned on the arrow mark as accurately as possible and lock the clutch. Look through the finder and Polaris should be visible. If Polaris is not central then bring it to the centre using the RA angle adjuster on the mounting to move up or down. To move Polaris right or left slacken the Clamp Nut that secures the mount to the Tripod. Use the fine adjustment knobs to rotate the mounting right or left. The EQ1 Mount will need to be gently rotated by hand as it has no fine adjustment. When Polaris is centralised in the finder look through the main telescope and centralise Polaris in the eyepiece using the RA and Dec adjusters. Re-tighten the clamps and return the telescope to the south facing position. On an EQ5 look up through the RA shaft to check that Polaris is in the centre. (The Dec must be raised to align the hole in the Dec axis shaft to allow sighting on Polaris.) The mounting should now be aligned accurately enough for optical use, for short exposure photography and webcam imaging. To check the alignment select any object in the middle of the southern sky. Release the RA and Dec clutches and locate and centralise the object in the finder. Lock the clutches and use the fine adjustment drive knobs to centralise the object in the finder. 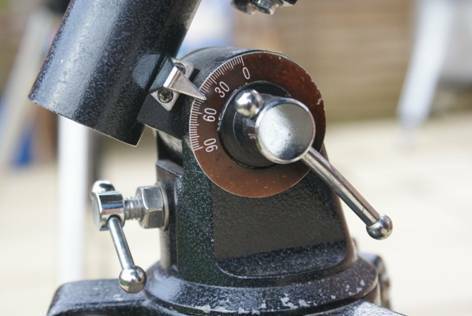 Look through the eyepiece of the main telescope and centralise the object using the fine adjustment drive knobs. Remove the low power eyepiece and fit a higher power eyepiece, perhaps 10mm. Allow the object to drift through the field of view. When it reaches the edge of the field of view use the RA fine adjustment drive knob to move the object to the opposite edge of the field of view and allow it to drift across again. Do this a number of times (for about 5 minutes). The object should not have moved up or down by any significant amount. The telescope should now be ready to use. There are other methods of alignment that can be used to obtain even finer accuracy in aligning the RA for long exposure imaging. These processes are more complicated and are not required for visual observations but will be covered in later articles. Once the RA Polar Alignment has been satisfactorily set, it does not need to be adjusted again for future observing sessions. It will only be necessary to level the tripod mounting and align it to north. If it is intended to use the same position to observe regularly it is worth making marks where the tripod legs are. By positioning the tripod on the same spots each time the process of setting the telescope level and aligned on north can be avoided. 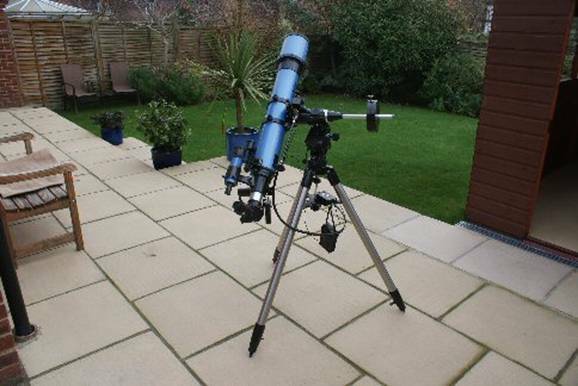 If possible the telescope should be set up on a paved area as this prevents the tripod legs sinking into soft ground and avoids slipping in the dark. It would also be preferable to have the telescope overlooking a grassed area because there will be less heat turbulence from the grass. The edge of a patio or on a path would be a good position. Brick walls and buildings close to the observing position can retain heat from sunshine during the day and cause heat convection currents in the cold night air. Moving air currents can cause shimmering and degradation of the image. Avoid lights that shine directly on to the observing position especially from the south. If there are unavoidable lights then set up a screen using canes and sheets or towels to stop the light shining directly into the observer’s eyes. Set up at least 30 minutes before the intended observing start time. This gives the telescope time to cool down to the ambient temperature and produce good images. Keep the dust cover on the telescope until it is time to start observing. It will help to avoid dew forming on the lens of a refracting, Schmidt-Cassegrain or Maksutov telescope. Make sure all the equipment that might be needed is to hand before starting. This is to avoid going indoors and spoiling the night vision. It takes about 20 minutes for our eyes to fully adapt to the dark but less than a second to lose it. If possible use a chair at the telescope it is more comfortable and steady. It is more difficult to stand still to look through the eyepiece than it is to sit still especially for prolonged periods. If a star chart is to be used only use a fairly dim red light or else the long sought after full dark adaptation could be lost. It is useful to make an observing plan before starting to observe. Notes of what is intended to be observed can be in the form of written notes or as a chart with notes. This avoids trying to think about what to look at next. Of course this need not prevent slow sweeps across the sky just to marvel at the stars as they pass through the field of view. It is well worth getting a planetarium application for your computer to check out what is available to look at from night to night. Last and as important as all the above, do dress to keep warm even on a mild night. The cold can soon begin to spoil the evening if it is not kept out from the start.